The Southern Appalachian Artist Guild (SAAG) is an organization of artisans and craftsmen from several states, Georgia, Tennessee and North Carolina, brought together to promote the business and professional development of its member artists. We are part of the historic Art Center in Blue Ridge, GA. We hold several members only shows each year (at least one is a traveling exhibition) and sponsor the National Juried Show for members and non-members. SAAG has monthly educational meetings, Show and Tell sessions, social events, access to master's level classes, and a credentialing program. Members also enjoy the camaraderie of meeting with fellow artists. Chartered in 2007 with only 25, we have now grown to almost 160 members. Won't you join us? Please visit our Membership Page for more information. If you are a member or interested in becoming a member, please join us for our monthly meetings at the Art Center. You will enjoy delicious refreshments, camaraderie and wonderful guest speakers. Meetings begin at 5 pm on the second Thursday of the month, beginning with a social hour. The business meeting and guest speaker begins at 6 pm. Meetings are held at the Art Center (Blue Ridge Mountains Arts Association), 420 West Main Street, Blue Ridge, Georgia. You can email us, here. All SAAG dates of importance on calendar, here. You can contact the webmaster, here. Marie-Luce Van Asten was born in Belgium, and came to the US in 2001. She graduated in Belgium as an Art teacher in 1983. Luce taught the French language at the Atlanta International School in kindergarten and elementary for 15 years. When her husband and she decided to retire in 2016 from their respective jobs, they turned their focus to their passion. Dominicus installed a wood shop studio in the garage and she designed a clay studio in the house with windows overseeing nature. They are fusing clay and wood work to create Sculptural and Functional Art. Luce is currently the President of the Southern Appalachian Artist Guild in Blue Ridge, GA. She has been recognized as a member of Excellence under SAAG. She teaches clay building and the pottery wheel classes throughout the year at the Blue Ridge Mountains Art Association and Art Center in Blue Ridge, GA. I have a background in art and design that has spanned a career of more than 40 years in the ceramics and glass industry where I was responsible for finding ways to industrialize new designs in the pottery, scotch whisky and perfumery markets. More recently I have been working in art with wood, in the form of marquetry, based on creating pictures by inlaying wood veneers from all over the world. As one half of the Branching Out Art team, I am responsible for the organizational aspects of the business such as keeping an inventory, applying to festivals and a myriad of other details associated with being a working artist. This frees my husband, Tom, to create innovative and imaginative art. Shortly after moving to the mountains in 2007, we both became members of and active in Art Center activities, becoming members of SAAG in 2008. I have been part of this wonderful mountain Community for close to 30 years. My life has always included some form of art or craft. My love is in fiber arts which I have created since I was a young girl learning from my Mother and Grandmothers. I knit, crochet, rug hook, sew, make jewelry with braiding and knots, and knitted wire. Painting is another art form that I enjoy and have had classes in watercolor, acrylic, and oil. Watercolor seems to be my most used medium. I have been painting for 20 years. I do some form of art or craft everyday. Suzanne was born in North Carolina, but spent most of her early years in Brazil. She remembers the bright greens and reds of the lush tropical plants against a lemon yellow sun and a bright, clear cobalt sky. This experience together with the clean crisp color of Winslow Homer is a big influence on her art. She has exhibited in galleries in Florida, South Carolina, Georgia, and North Carolina. She enjoys teaching at John C Campbell Folk School, NC, in Port Clyde, Maine and at Edisto Island, SC. Her work has been on four covers of the John C Campbell Folk School Catalog and is on the cover of the new John C Campbell Cook Book. My favorite art mediums are egg tempera, colored pencil, and graphite; and my subjects tend to be botanical drawings and pet portraits. My art education began with several studio art courses in college. Much later I participated in short courses and workshops in Atlanta, GA, at the Art Center in Blue Ridge, GA, and at the John C. Campbell Folk School in Brasstown, NC. 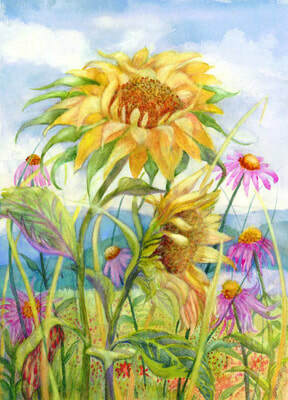 My drawings and paintings are exhibited from time to time in SAAG shows at the Blue Ridge Mountains Arts Association. I am currently a member of the Board of Directors of BRMAA, and I am Hospitality Chair of SAAG as well as a Signature Member. As a 2-D artist, I paint using acrylics on watercolor board in a traditional representational style. I received my degree in Fine Arts from Purdue University and developed my methods and techniques in the years since. My husband and I moved to the Blue Ridge area in 2016 from New Hampshire specifically because of the reputation the area has as an artist community. 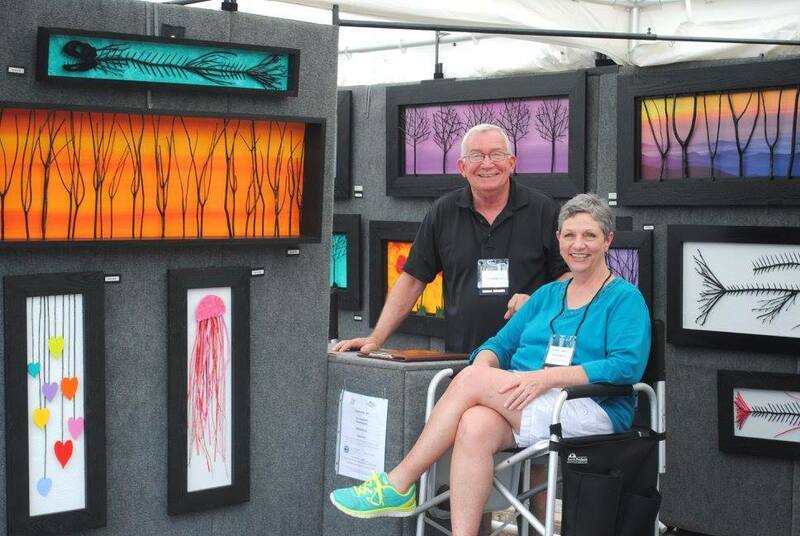 Kim joined the Blue Ridge Mountains Arts Association and the Southern Appalachian Artist Guild in 2011. Since becoming a guild member, she has served on the SAAG Executive Board as Secretary, Hospitality Chair, National Juried Show Chair, and is currently the Member of Excellence Chair. She is a graphite and colored pencil artist who is also a member of the Blue Ridge Pencil Artists and a Signature Member of the Colored Pencil Society of America. Send us a message if you would like more information on our guild.